According to figures for global asbestos production, trade and consumption released by the United States Geological Survey for 2006, the use of asbestos in North America is of little consequence to the asbestos industry; in 2006 the U.S. and Canada consumed minus 48,352 metric tons; Canada exported more asbestos than it produced and the U.S. exported more than it imported.1 Even in the absence of national asbestos bans, there is minimal use of the deadly fiber in these industrialized countries. Nevertheless, asbestos practices and debates in both jurisdictions remain of intense interest to vested interests. For decades, Canadian asbestos lobbyists have exploited the political fragility of the Canadian federation to stifle open debate on asbestos; however, their ability to silence their opponents and dictate that only pro-asbestos messages are broadcast is eroding. Whilst the continuing lack of a U.S. asbestos ban remains of comfort to the asbestos public relations machine, recent developments on the West Coast indicate that mobilization of American asbestos victims will, once again, force this issue onto the political agenda. Directors of Québec asbestos mining companies: Simon Dupéré (LAB Chrysotile) and Bernard Coulombe (Jeffrey mine). Here one is not in the presence of facts. It is about a point of view which deserves to be heard but which is hotly disputed. Let us recall in particular that beyond the petrochemical lobby, France evoked public health concerns for its decision to ban asbestos (the chest diseases of personnel from the Jussieu University Campus, insulated with asbestos, caused the (French asbestos) scandal. 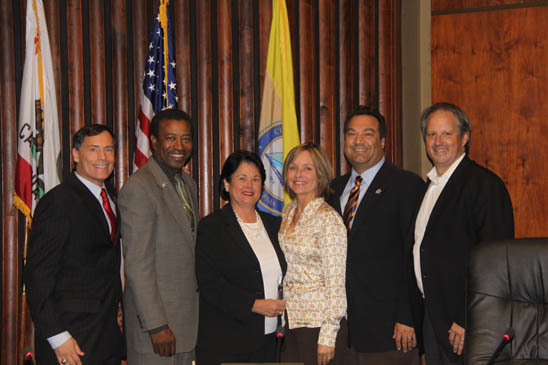 Linda Reinstein (centre left) with Manhattan Beach Council members. The Reinstein family is no different to families in Japan, Thailand and China who have lost a loved one to asbestos. In 2004, 2006 and 2009 the ADAO took part in asbestos victims' conferences in Tokyo, Bangkok and Hong Kong. I had the opportunity to speak with victims whose families had been devastated by their asbestos loss. We shared an anger at the avoidable deaths that caused so much heartache and we shared the determination to turn our asbestos anger into activism. 5 Canada's public radio and television broadcaster is the Canadian Broadcasting Corporation ; in French, it is called la Société Radio-Canada.